Marketing is all about ideas. And Marketing Excellence is about good ideas made great. The companies it features have been selected because they are winners – both literally and commercially. Literally in that they have received Marketing Society Awards for their work in Britain; commercially in that these efforts have resulted in measurable market success. They come from a diverse range of markets; it’s likely that some operate in yours. Written by two marketing thought leaders and featuring insights from a host of industry experts who have judged the Awards in recent years, here is a collection of brands and companies that are doing things right. 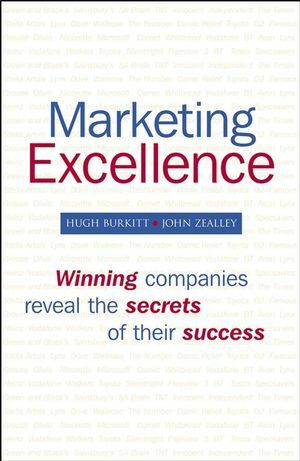 From ketchup to cosmetics, it offers today’s most revealing, readable and above all relevant lessons in Marketing Excellence. HUGH BURKITT is Chief Executive of the Marketing Society, which is the leading network for senior marketers in the UK. At the Society he was responsible for the launch of the Society’s Manifesto for Marketing, introduced the Marketing Leaders Programme for potential marketing directors and established the Panoramic Group, which has created a new forum where all the UK’s marketing organisations have agreed to work together to promote marketing. He is a council member of the Advertising Association, and has also served on the ASA Council, the IPA Council and the Complaints Panel of the Portman Group. In February 2005 he completed a walk up Kilimanjaro to raise money for VSO projects in Tanzania – where he had been a volunteer teacher nearly forty years earlier. JOHN ZEALLEY is the Managing Partner of Accenture’s European Consumer Goods & Services practice, where he works with senior executives of leading companies on multinational growth and business reorganization programmes. As a consultant, initially with McKinsey & Co and latterly with Accenture, John has worked with consumer based businesses in such diverse sectors as financial services, food and drink, grocery and general retailing, leisure and healthcare and in markets across Europe, Africa, Asia Pacific and North America. John is a Fellow of the Marketing Society and sits on the Editorial Board of Market Leader, the Society’s quarterly journal. He is a Liveryman of the Worshipful Company of Marketors. In addition, he uses his marketing skills with a number of not-for-profit organisations, including Cancer Research UK, The Royal Shakespeare Company and the Institute for Citizenship. Introduction: So What’s the Big Idea? 6 Sustaining the Brand Promise. 7 Marketing Communications: Getting the Message Across. 9 Crossing Borders: International Brand Development. 10 Internal Marketing: Engaging Employees. 12 Doing Well by Doing Good. "...by examining the excellence of others we can all improve our own efforts."